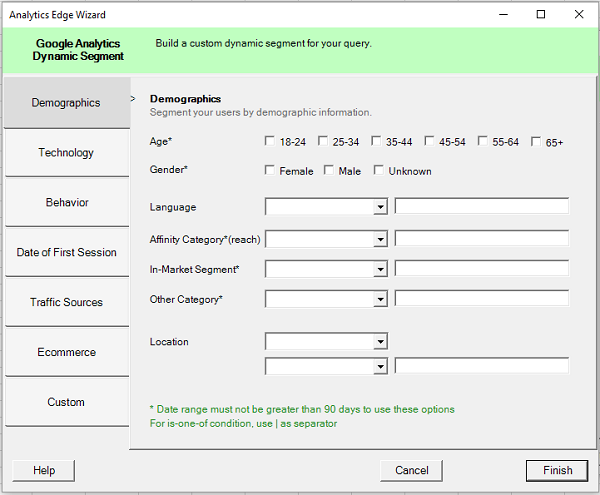 Analytics Edge makes it possible to create dynamic segments using a a wizard interface similar to that in the web version of Google Analytics. 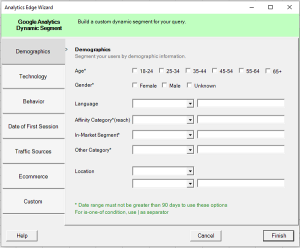 Select the category to the left, then select the options you want in your segment to the right. You can add multiple conditions in a single segment, and all conditions must be met for a session to be included in the condition. It is also possible to enter a Custom expression to pass direct to the API &segment= parameter (must be properly formatted). This can entered directly into the wizard, or an Excel cell reference can be used to a worksheet location. This entry was posted in Google Analytics on 2014/08/20 by functions.